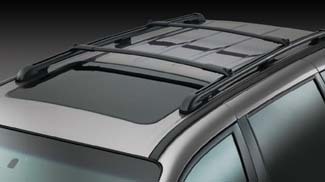 This durable, all-purpose, permanent-mount Roof Rack is a convenient way to increase cargo capacity. Versatile design accepts bicycle and ski / snowboard carrier attachments and features 100-lb. capacity evenly distributed. Attachments not included.. Without sunroof, dealer installed accessory.